If you wish to learn how to play bridge contact your District Education Officer or look up your District education web site or contact me, telling me where you live and I will endeavour to tell you the location of your nearest class or tutor. We have lesson materials fo all stages of learning the game. In addition to running many adult courses throughout the country we are teaching minibridge in some primary schools and bridge in secondary schools. We aim to expand this service. These classes are run in curriculum time or at lunch time or after school clubs. 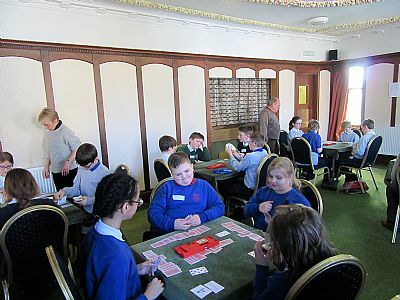 a number of bridge clubs are also running courses for young learners. Some clubs and bridge centres are running very successful clubs for young learners and alo some successful summer schools. If you wish to get involved in this program either as a school or as a tutor, or as a club, your District Education Officer. As young people progress their skills our Youth Coordinators Anne Symons and Paul Gipson get involved organising extra training courses to train our next generation of youth internationalists. In schools, tutors work mainly in teams and cover for one another when on holiday. For primary schools, only a very basic knowledge of bridge and a love of working with children is all that is required. If interested contact your convener.